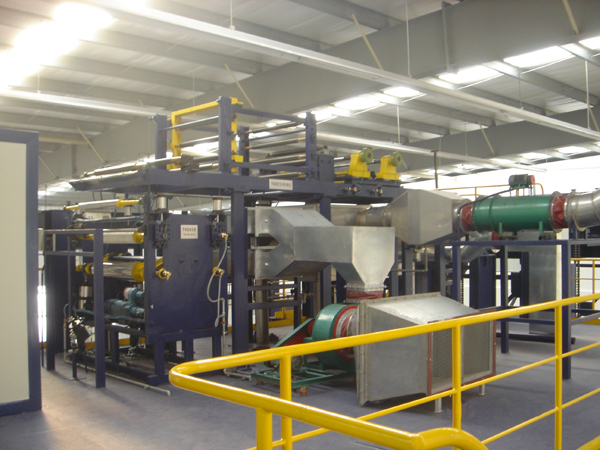 To perform surface treatments on various metal roll plates and wire materials, including acid cleaning, degreasing, electrotinning, electrogalvanizing, phosphatization, oxidation, hot-dip galvanizing, anti-finger print, color-painting, and film coating. 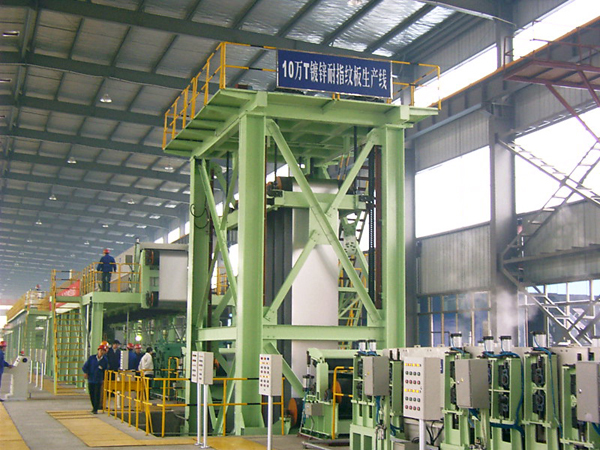 Input process: The input equipment of the electrogalvanizing production line is mainly constituted by unreel equipment, a shearer, a welder, a looper, and a tension leveler. 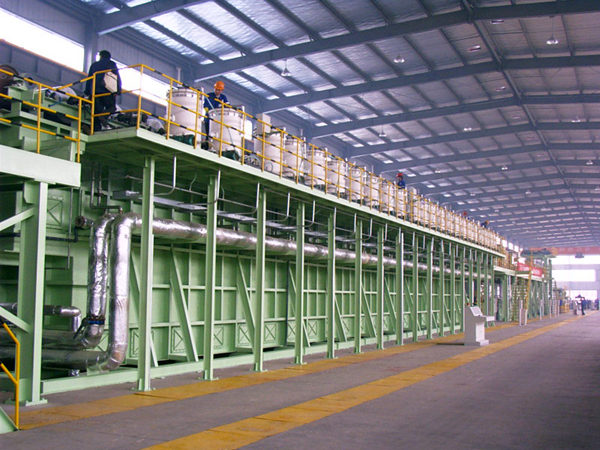 Pretreatment: The pretreatment engineering mainly involves an acid-cleaning tank and a rinse tank for removing contaminants from the surface of the steel strip by electrolytic cleaning and removing oxidation films before electrogalvanizing. 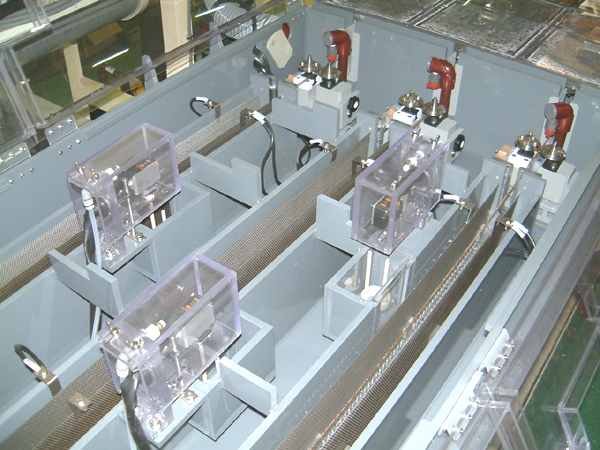 Electroplating: The electroplating mainly involves an electroplating bath, a conductor roll, an anode assembly, a rectifier, and a sink roll. 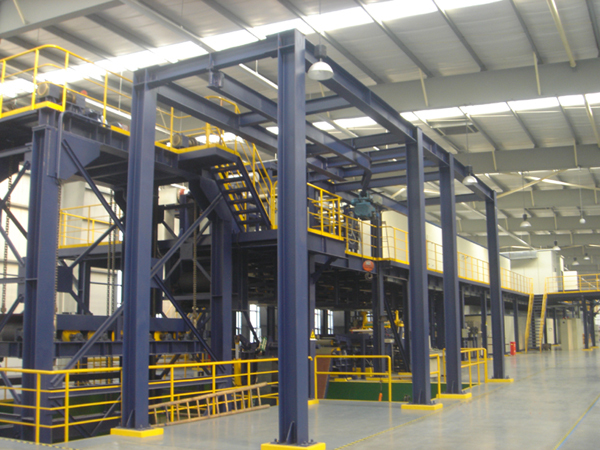 Post-treatment: This treatment mainly involves equipments for enhancing corrosion resistance and coating capability, so as to perform greasing, phosphate, chromate, and anti-finger print treatments. 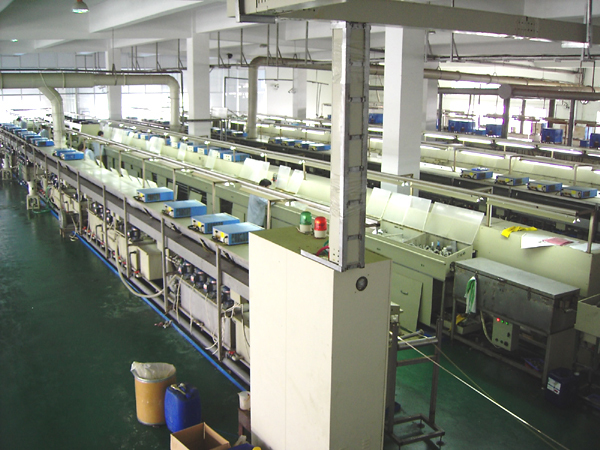 Output process: The output equipment is mainly constituted by an output looper, a tension leveler, and an automatic packing line for protecting the product quality after coiling. 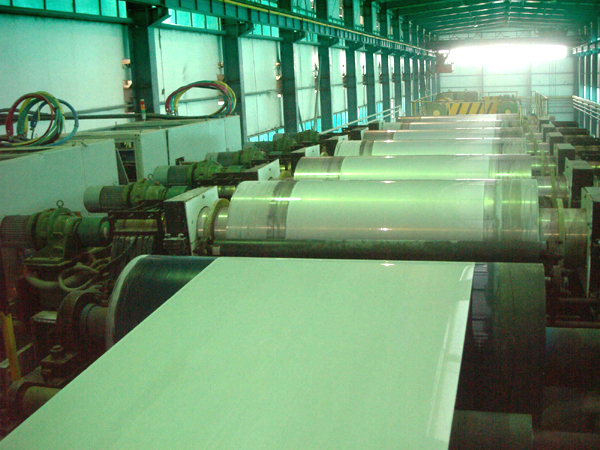 Compared with GI and GA, this steel plate is less galvanized and not affected by heat generated during the manufacturing process, and ensures the same material characteristics and processing performance as the original material -CR. Corrosion resistance The sacrificial anode effects caused by the galvanic action of Zn may protect Fe (ZnZn-2+2e-,2H+,+2e-->H2), and the newly formed alkaline carbonate film due to being exposed in the open air is also anti-corrosive. 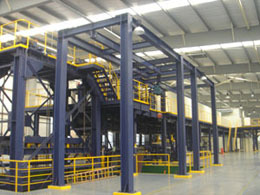 Coating capability The steel plate has a smooth surface and thus ensures a desirable coating effect. Moreover, after the phosphate treatment, the coating effect of the paints and the corrosion resistance after coating are both improved. Weldability The galvanized steel plate has a large contact area upon being pressed. Compared with CR, this steel plate has poorer electric conductivity and weldability. However, desired stop welding and seam welding can be carried out as long as appropriate welding conditions are maintained and a post-treatment is performed. Zn-Fe(Zn-Fe-alloy plated steel plate) Compared with Pure Zn, the content of Fe in the plating layer achieves more desirable weldability, desirable paint adhesion feature, and satisfactory corrosion resistance after coating. Zn-Ni(Zn-Ni-alloy plated steel plate) This steel plate mainly aims at prolonging the automobile anti-corrosion (anti-pitting corrosion) duration caused by the salt (NaClCaCl2) for preventing the road from being frozen. Compared with other plated steel plates, the Zn-Ni-alloy plated steel plate has a firm plating layer and has a high melting point due to the added Ni. Therefore, compared with Pure Zn, this steel plate is firmly plated and not easily softened or melted. Meanwhile, the steel plate is capable of being welded due to its low current, and has desirable uncoated corrosion resistance, which can resist corrosion for a long time. Copyright © 2008 Nanjing Sifang Surface Technology Co., Ltd.